Chris Cornell (born Christopher John Boyle; July 20, 1964), Seattle, WA, United States, is an American singer/songwriter and guitarist In 1984 he formed the band Soundgarden with bassist Hiro Yamamoto. Throughout the late 1980s and 90s, Soundgarden experienced major success as one of the major grunge bands (along with groups such as Alice in Chains, Nirvana, and Pearl Jam). In 1990, Chris Cornell worked together with the (then) Soundgarden drummer Matt Cameron, and Stone Gossard, Jeff Ament and Mike McCready (who would later form Pearl Jam) in a project named Temple of the Dog. In 1984 he formed the band Soundgarden with bassist Hiro Yamamoto. Throughout the late 1980s and 90s, Soundgarden experienced major success as one of the major grunge bands (along with groups such as Alice in Chains, Nirvana, and Pearl Jam). In 1990, Chris Cornell worked together with the (then) Soundgarden drummer Matt Cameron, and Stone Gossard, Jeff Ament and Mike McCready (who would later form Pearl Jam) in a project named Temple of the Dog. They wrote a 10 song album as a tribute to Andrew Wood, the singer of Mother Love Bone who had died the year before of a heroin overdose. In 1997 Soundgarden split at the zenith of their popularity due to tensions in the group and Chris began a solo career. He released the sucessful album Euphoria Morning. Out of this album came the single Can't Change Me. When Zack De La Rocha left Rage Against the Machine in 2001, Chris Cornell joined the instrumentalists of Rage Against the Machine to form the band Audioslave. In 2006 Chris recorded a theme song for the James Bond 007 movie, "Casino Royale", titled You Know My Name, which is used as the opening song. In the fall of 2006, Cornell started recording his second solo album Carry On, with producer Steve Lillywhite. Among some fellow artists who are expected to accompany him on his second solo release is friend and legendary musician Gary Lucas, who has contributed acoustic guitar to some of the tracks. Cornell has stated that he is always writing, and that there are some songs that he was not able to put into an Audioslave album. Carry On was released in the summer of 2007. On February 15, 2007, Chris Cornell issued a statement that he was leaving Audioslave, shortly after Tom Morello, Tim Commerford and Brad Wilk reunited with their former vocalist Zack de la Rocha to reform Rage Against the Machine. 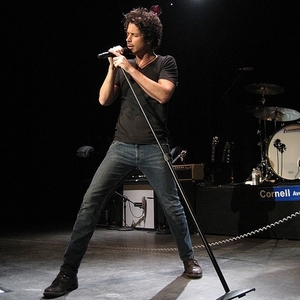 Chris Cornell released his third solo album, Scream, with American rapper and record producer Timbaland on February 3rd, 2009. This album was a critical failure, and sold poorly. It is rumored that he is going to try and "De-Timbalandize" the tracks. On January 1st, 2010, Chris Cornell announced the reunion of Soundgarden after a 12 year hiatus.